I’ve been a fan of Johnny Enlow’s books for some time, but this one more than any book I’ve read in the past few years put into words many of my feelings on what’s wrong with Western Christianity, and more importantly, what’s right, with a tremendous hope for the glorious expression of our faith that is coming. Johnny explores what God is doing and is about to do in each of the seven “mountains” or primary spheres of society: religion, education, family, government, economy, media and celebration/arts. With an insightful understanding of history and a true prophetic vision of what’s on God’s heart for this hour, he paints a panorama of beauty, restoration and glory that the Bride (church) of Christ will become by 2050. Johnny also instructs those on each mountain in what we can do to get there. As an educator, I was excited to read his concepts, aligning so closely with changes in education that I’ve been feeling needed to happen. His chapter on the economy talks about new models of business that integrate properly with the other spheres of life to become blessing to all of them rather than dominate or steal from them. The school where I teach for years has been operating under a completely different model of success than the world’s, but this was the first time I read about it in terms of God’s heart to make business glorious. Another strength of this book is how Johnny unpacks some of the controversial issues of today. I’ve rarely found American Christian writers I can fully agree with on some of today’s tough issues such as abortion, homosexual marriage, women’s rights, immigration, racism, prison reform, and relating to those of non-Christian religions, but Johnny eloquently and prophetically expresses perspectives on these issues that reject the rule of fear and truly reflect God’s love, with fresh ideas for followers of Jesus on how to reengage these spheres with that love and immense hope for His goodness to breakthrough. When we tackle any of these issues motivated by fear, we can fall into dehumanization, building walls, and trying to isolate ourselves from the very people God wants to put His arms around and embrace. We choose to align ourselves either with a fear-filled worldly cynicism or a hopeful, loving pursuit of God’s Kingdom (His better ways of doing things) coming “on earth as it is in heaven” by how we pray; what we choose to post, tweet or Instagram; what different kinds of people we’re willing to make friends with; and how we choose to invest in building a culture of love, light and life all around us. Johnny writes, “No matter what your race, culture or nationality, God is restoring the destiny of your city and your nation.” Each one of us has a part in this global renaissance. Find out more at www.johnnyandelizabeth.com. 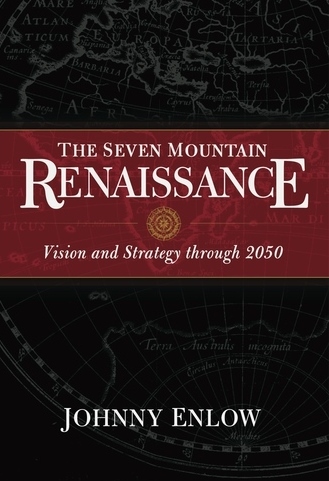 Buy from Amazon: The Seven Mountain Renaissance: Vision and Strategy through 2050 .